Munich: Is this the final refuge for TSV 1860? Jordanian investor of TSV 1860 met with the mayor of Munich to discuss possible options for the club’s relocation. Or a single option, rather, because there’s only one stadium site available. After years of dissatisfaction with Allianz Arena the “smaller” host team TSV 1860 is yet again attempting to relocate from northern Munich to a new stadium. Jordanian owner Hasan Ismaik met with mayor Dieter Reiter to discuss available options. Insufficient infrastructure makes the current Grünwalder Strasse Stadion not feasible in the long run. Building a new one in the same neighbourhood of Giesing is also out of the question. A more recent idea of building next to the Olympiastadion also fell through. What’s left now? 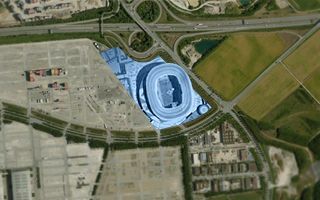 It seems the only viable alternative to Allianz Arena is settling in eastern Munich, beside the exhibition complex Messe München. The actual plot in question is coloured blue on the below map. It’s considered an expensive site to develop, but it’s also the one that could get TSV 1860 on their own the fastest. Operator of the exhibition complex already expressed the will to see a football stadium built there.